Today, here on the table, we have a 27” Mirror Smart TV AVEL AVS270SM. Let’s have a closer look if we can trust all declared features. Today, here on the table, we have a 27” Mirror TV. The manufacturer announces this model is suitable for bathrooms, pools, kitchens, and other areas where water can get on the screen easily. So, the model is waterproof and has IPx4 water protection as declared. Let’s have a closer look and see how they achieve it and if we can trust all declared features. While unboxing the unit, we noticed the box (carton quality) is good and internal white foam packing protects the unit well. So, we may say it can be sent by courier (we got it this way actually) and risk of damage is low unless someone drop it from a considerable height or pierce it. Accessories are just as described on the manufacturer’s website, including installation metal frame, two remote controls, power adapter, and screws. TV’s back is made of metal and looks a bit rough at the first glance but considering it’s in-wall model and never supposed to be seen we think it’s OK. Metal back works as a radiator on TVs like this and required for heat dissipation purpose. Front of the TV is beautiful, it’s a true glass, silver color and it’s bright. We can say that “mirror” function of this TV is very good. 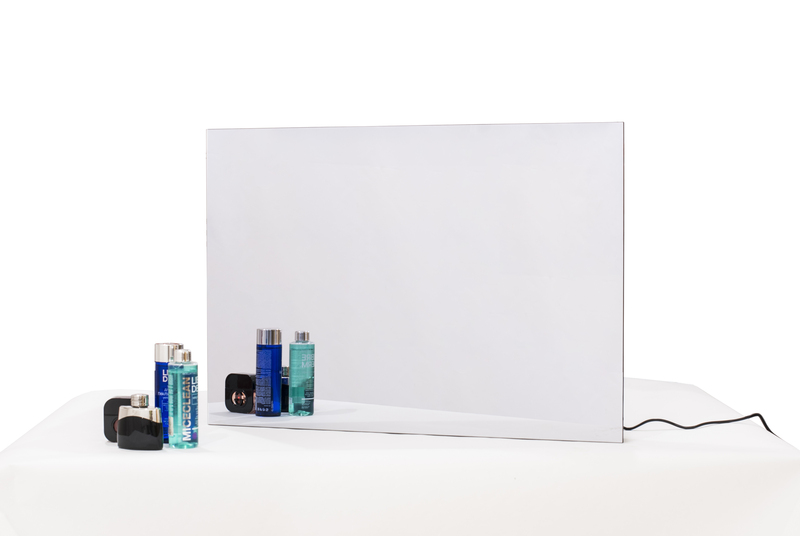 We have seen other similar products and it happens that mirror is dark, or the screen area is seen, both is not what people expect to see when order a mirror tv. It’s not the case with that sample. All right, we can turn the TV on... After the power plug connection, there is a red LED appeared (not well seen through the mirror, actually). Oops... there are no batteries in both remotes! After checking with AVEL, they confirmed they cannot add batteries if the TV is shipped by air due to transportation restrictions. So if you order with a courier delivery—be aware of preparing the batteries in advance, two AAA for the silver remote control and CR2032 tablet type for slim waterproof remote control. With batteries inserted, we finally power up the screen and start with USB demo splits playback. Okay, the TV supports 1080P video files and Dolby Digital sound (AC3), that’s good cause many products from China cannot play it and there is a need to decode the videos. The picture itself is good for a Mirror TV screen but comfortable watching requires light dimming. No matter what manufacturers say you will see a reflection on a dark scene if there are some lights opposite the screen. We may say it’s a specific issue you have to keep in mind when ordering and installing this product. They call it Magic Mirror, of course, there is no magic but physics of the light reflectance and transmission. This particular TV has a good R/T ratio, but to get good contrast there must be no bright lights in the room and no lights/windows at all opposite the screen. We were concerned about the sound quality. AVEL announces “invisible resonance speakers” as one of unique feature but how does it work in reality? Well, the result is better than expected... It has true bass unlike small consumer TVs with small regular speakers and this vibration speakers provide powerful sound enough for an average size bathroom. We were surprised and upset at first with the lack of analog audio out, but we noticed HDMI ARC and tested it with a soundbar. So we can say it works good and if you plan to use an AMP and external speakers—just get the sound by HDMI and turn on HDMI ARC in the settings. Smart TV—the TV we got has no smart TV by itself but support screen mirroring function. We tested it both with Apple (AirPlay) and Android devices. Nothing surprising us here. It works stable and fast with both and it supports sound transmission too. Good feature to share photos and videos or to browse YouTube, but still, it’s not a built-in smart TV. So, let’s say it’s an alternative, but not for everyone. Waterproof grade—we didn’t take any real waterproof test by ourselves and only checked the TV visually. The front glass is sealed to a metal case well and we think this joint is waterproof, no doubt here. There is a metal lid on the back to cover I/O ports. Actually, it was not easy to take it off first, it got stuck a little but was taken off after some efforts were applied on a side. Seems like rubber sealing band is sticky and can be damaged when taken the lid off after a long storage (we advise the manufacturer to improve this small issue and add talcum powder or another not sticky coating). Anyway, it shall work well for waterproof purposes. Besides the rubber bands, there is a soft sponge in the bottom where all the cables go. We’ve seen similar solutions from other manufacturers and in general, it looks enough to provide splash proof protection as declared (IPx4 code means: water splashing against the enclosure from any direction shall have no harmful effect). I/O ports—the TV has all the standard ports, two HDMIs, two USBs, and one TV-In (for DVB-T/T2/C/Analogue), one TV-In (for DVB-S2), and CI+ for paid channels. In addition, it has an IR pass-through connection, this can be used to control a set top box if it’s installed hiddenly and connected to the TV by HDMI. But make sure the STB has IR input or you will need an IR transmitter device. Our overall, the impression is positive, and we can say it’s one of the best waterproof TV we’ve seen so far. Advantages: good mirror, waterproof design, modern TV board, screen mirroring function by WiFi. Weakness: MSRP US$1179 for DVB version is quite high to compare with consumer TVs but in line with the mirror TV market. A built-in smart TV would be more convenient for users.